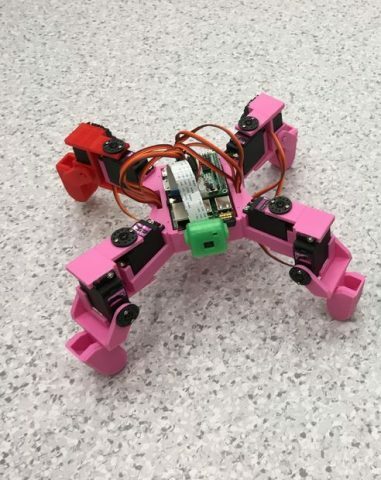 ScoutBot: Raspberry Pi 8 DOF Wi-Fi Quadruped Robot @Raspberry_Pi #PiDay #RaspberryPi « Adafruit Industries – Makers, hackers, artists, designers and engineers! Nice Build and write-up from instructables user Shoyu. Here, we present our Raspberry Pi 8 DOF Wi-Fi quadruped robot. The robot is featured video vision streaming and Wi-Fi control via simple web UI. We release all information to people to build it by themselves. Any Pi version from 1A+/1B+ to 3 and Zero/Zero W can be used to build this robot. Below figures show an implementation using Pi B+ and camera module V1.3.